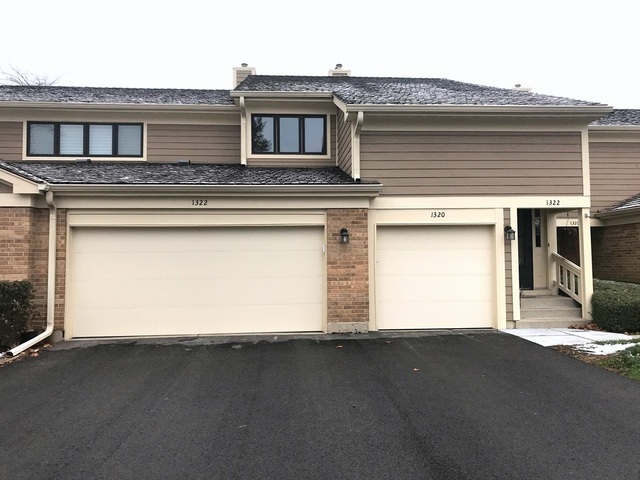 Fabulous rental opportunity in Libertyville's Riva Ridge. Second floor townhouse boasting an updated kitchen, master bathroom with spa-like shower, skylights, storage, attached two-car garage, NEW hot water tank, NEW furnace, NEW air conditioner, neutral decor and MORE! Private entrance. Sparkling kitchen featuring porcelain tile floors, white cabinetry, eye-catching counters, white appliances, pantry and an eating area. Spacious living/dining room offers you a vaulted ceiling with skylights and a sliding glass door leading to a private balcony. Open to the living/dining room, the den features a dry bar and cabinetry for added storage space. With a vaulted ceiling, the master bedroom includes a storage closet, generous closet space and an updated bath complete with a custom double bowl vanity with granite counters and a spa-like shower with tile surround and glass door. An additional bedroom, full bathroom and a laundry room complete the home. Pets will be considered with deposit.